“You can't grow Canna Lilies here. They are tropical plants, not meant for our zone.” This was a recent statement made by a “dyed in the wool” British gardening friend. If you are an adventuresome gardener, like me, you recognize a challenge when you hear it. When you go plant shopping at a nursery or garden center, most plants will have a tag that shows the United States Department of Agriculture (USDA) Hardiness Zone. Hardiness Zones were created in order to guide growers and provide gardeners with an easy way to determine which plants are most likely to thrive in any given location. The Zones are defined by the average annual minimum winter temperature. They are then subdivided into sections A and B, based on 5-degree F increments. If you visit the Agriculture Research Service (ARS) (http://planthardiness.ars.usda.gov/PHZMWeb/) web page, it is simple to enter your zip code and find your Zone. Bishop, where I live and garden, is in Hardiness Zone 7b, with 5-10 degrees F minimums. 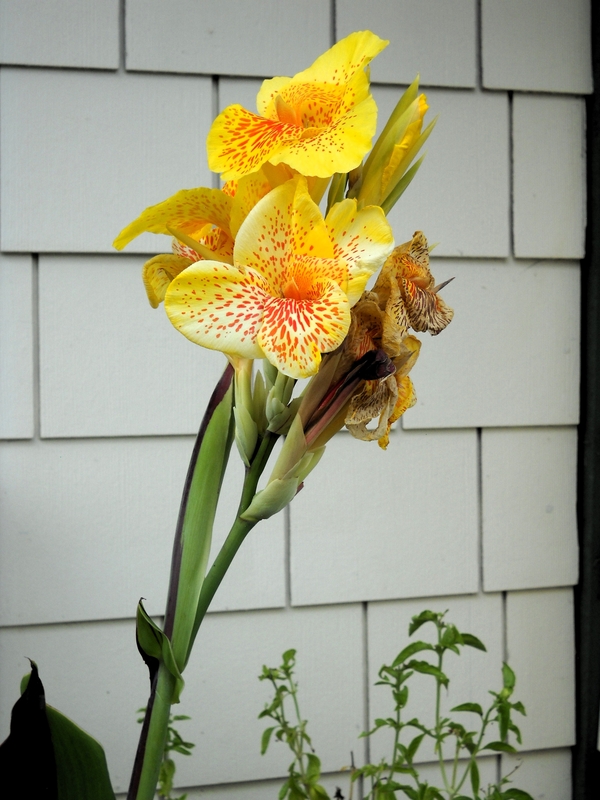 And that Canna Lily I mentioned is a Zone 8-11 plant. So, my friend is certainly correct! However, if I can find a microclimate in my yard, things just might work out for me and the Canna Lily. A microclimate is the climate of a small area that is different from the area around it. It may be warmer or colder, wetter or drier, or more or less prone to frosts. These areas may be quite small – a protected courtyard next to a building, perhaps, – or it may be quite extensive, an area extending several miles inland from a large body of water, for example. In general, large bodies of water tend to moderate air temperatures of adjacent inland areas - low temperatures in winter are not as extreme, and these areas are less prone to late spring and early fall frosts. Smaller bodies of water, like a pond in your yard, have the same effect, just to a lesser extent. Another example is urban areas which tend to have less extreme low temperatures that the surrounding countryside because buildings and paved surfaces absorb heat during the day, then radiate it back into the air at night. These buildings also offer protection from the wind. Topography also has an effect on micro climates. Cold air flows downhill and collects in low spots so hilltops may not suffer as much from frost or cold temperatures. For example, here in Bishop, it is generally colder down at the airport by the Owens River that it is up at Apple Hill Ranch in Wilkerson. Of course, north facing slopes are slow to warm up because they receive less direct sun compared with south facing slopes. Large scale micro climates dictate how our area is USDA Zoned. There is not much one can do about these effects except to be aware of them and let them guide plant selection and garden timing. However, you can look for smaller scale micro-climate effects at work in your yard and take advantage of them. Just like urban areas, your house absorbs heat during the day and radiates it back at night. It also offers shelter from prevailing winds and presents areas of shade and warmth. Fences, walls and large rocks can provide shelter and radiated heat. Raised beds, terraces and balconies can, like hillsides, offer a warmer, well drained space for growing. Paved surfaces, trees and soil types also offer opportunities and challenges, depending on what you might like to plant. In addition to the USDA Hardiness Zone, other things that must be taken into consideration when choosing plants include its needs for light, moisture and care throughout the growth cycle. There are also environmental factors such as wind, pollution and localized microclimates. Be aware of driveways, sidewalks, patios, and paved paths that can absorb heat during the day and re-radiate it at night, moderating night-time temperatures. If impervious, these areas can't absorb water, and may create wet spots if the water that flows off of them goes into one, concentrated area. The same can be applied where water flows out of downspouts and gutters or off of roofs. Focus, also, on height, spread, and orientation of trees and current plantings. Tall trees can create excellent micro climates on your property by shading and protecting plantings, but they can also prevent rain from reaching the ground and provide too much sun protection in the summer, too little in the winter, especially if deciduous. Another consideration about trees: competition for water and nutrients created by the roots may make it problematic to grow less-competitive plants around the base. Remember, no hardiness zone map can take the place of what you know and have observed in your own garden and yard. For instance, I made the mistake – some years ago – of planting a sapling cherry tree in what I thought was a fine place – and now I realize that it is in the shade of my large, old apricot tree, so it doesn't get much sun. By the same token, I have learned to plant my lettuce in the shade of other, taller vegetables so that I can have lettuce all summer, right along with my tomatoes! Raised beds and containers promote early growth, since they warm up sooner in the spring than the rest of the ground, especially if one edge of the bed or pot faces south. They can also provide optimal soil conditions. Use row covers. Woven polyester row covers have the advantage over clear plastic covers because they allow air circulation around the plants. Structures that surround plants...help store heat during the day and release it at night to protect plants from frost. Incorporate mulches to create desired micro climates by warming the soil (black plastic), cooling the soil (alfalfa and/or wheat straw), controlling weeds, and conserving moisture. Let's say you want to have lettuce for your sandwiches and spinach for your salads outside of the “normal” growing season for these vegetables. You can tap into the benefits of creating microclimates in your vegetable garden to accomplish this goal. By utilizing south-facing raised beds in full sun you can get your seeds planted a week or two earlier in the late winter. By planting in containers you can move to a shaded area in the summer, you can extend the productive period for these cool season crops. And, by using winter-weight row covers in the fall, you can protect these tender plants from the falling temperatures...often extending well past the first frost. Or, maybe you want to grow a canna lily in Zone 7b. Creating a micro-climate by planting in a pot and moving it to favorable locations according to the season is one solution. I chose to put mine in a sunny south facing corner by my house. The corner is protected from the wind and a warm toasty place in any season. I used mulch to keep the roots moist and covered the rhizomes with more mulch to make it through the winter. A raised bed might also be helpful in the future. Gardening by using the concept of micro climates is, of course, a risk. We shall see what happens if the El Niño winter that is predicted comes to pass. All gardening, in the end, involves risk. And, the more I observe my garden, throughout the day and throughout the seasons, I can see where the microclimates exist, so that at least the risk is calculated!